Brief and inexpensive, this engaging book helps readers identify and then discard 52 misconceptions about data and statistical summaries. The focus is on major concepts contained in typical undergraduate and graduate courses in statistics, research methods, or quantitative analysis. Fun interactive Internet exercises that further promote undoing the misconceptions are found on the book's website. Internet Assignment - an interactive activity to help readers gain a firm grasp of the statistical concept and overcome the misconception. The book's statistical misconceptions are grouped into 12 chapters that match the topics typically taught in introductory/intermediate courses. However, each of the 52 discussions is self-contained, thus allowing the misconceptions to be covered in any order without confusing the reader. Organized and presented in this manner, the book is an ideal supplement for any standard textbook. 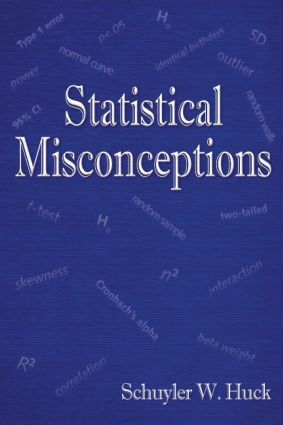 Statistical Misconceptions is appropriate for courses taught in a variety of disciplines including psychology, medicine, education, nursing, business, and the social sciences. The book also will benefit independent researchers interested in undoing their statistical misconceptions.